Jase Te Patu is co-owner of Power Living Yoga in Wellington, winner of the coveted Studio Facility of the Year at the NZ Exercise Industry Awards 2017. 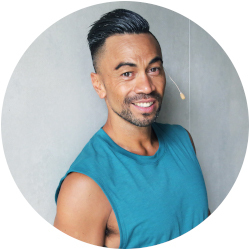 A former dancer who toured overseas and competitive sportsman who represented NZ in springboard diving, gymnastics, and aerobics, he is known these days in as an International yoga and meditation teacher and trainer, speaker, and advocate for mental health and well-being. Jase found yoga from an injury whilst dancing in South Africa. He has trained with a wide range of teachers including Les Levanthal, Ana Forrest, Eion Finn, Mark Breadner and Tiffany Cruickshank, but it was Power Living Teacher Training in 2010, that shifted Jase’s life path into the world of Mindfulness. Recently Jase has released “M3” – A Mindfulness programme for tamariki ages 5-10years. M3 takes Māori myth and shares our beautiful stories through movement, with an emphasis on the ‘how you’re being”, rather than “what” you’re doing. The mindfulness comes from the breath work at the end of the session, beautifully integrating the ideas of ‘Hau Ora’ i.e. through whānaungatanga or togetherness, the children cultivate awareness through body and mind, thus creating a brighter spirit! HAU O-RA meaning ‘ the vital essence of the sun”… OR the light that exists within you and in me!